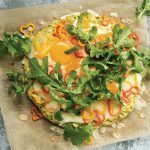 A zucchini crust is too good to pass up, especially as used in this breakfast pizza. Unlike a cauliflower crust, zucchini crust is firmer and doesn’t break up as easily, so you get a more dough-like consistency. 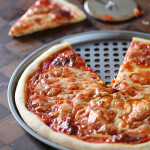 Carla Bartolucci, author of Einkorn: Recipes for Nature’s Original Wheat, calls this New York–Style Pizza to distinguish it from Italy’s Neapolitan pizza. See Faith’s review of Einkorn to learn more about Carla and this ancient grain.